In the 1970s and 80s, there was one female impersonator that stood out from them all. Her name was Divine. She was brash and crude. She made her fame by pairing with the king of shock value. But underneath the painted face was a troubled man who wanted nothing more than to be taken seriously. Written by E. Dale Smith, Divine/Intervention chronicles the final night of Glenn Milstead's life. To tell this story, a unique concept was used. 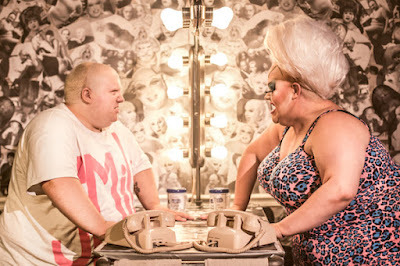 Glenn spoke to Divine through a mirror. They are one in the same and the mirror was a strong metaphor. Director Braden Chapman was smart by utilizing the mirror idea, for the most part. Whatever Glenn would do, Divine would mirror. And of course sometimes Divine would break loose from Glenn’s actions. But then Smith adds a new element. The flashback. And it was awkward and inconsistent to the main story structure. It's always more beneficial to show not tell but the way Smith and director Chapman approached it was trite and not beneficial to the piece at large. The other interesting element the piece did was turning Divine into a villain, intentionally or not. Its no secret Divine was a diva. She was difficult to work with. But was she that much of a burden to Glenn? Did he truly hate her as much as it was portrayed? You certainly sympathized with Glenn and it's likely you had a new opinion on his alter ego. But perhaps that was the goal of the thesis. To show how trapped Glen was in that body. Just be glad Smith didn't borrow Jekyll and Hyde's "The Confrontation" during the epic stand off at the end. Regardless of structure, you must commend Ryan Walter and Bobby Goodrich as Glenn and Divine respectively. The duo were completely in sync and they poured their heart and souls into their performances. They clearly did their research and trusted one another. The trio of boys as the surrounding men did a stellar job as the help, especially Nicholas Scheppard as the instantly recognizable John Waters. Director Braden Chapman is also credited with the original concept. How much of the concept was integrated into the production is unclear but Chapman had difficulty with clarity when it came to the structure. Jumping in and out of flashbacks was greatly jumbled. With the textual transitions a bit forced, Chapman didn't aid in making them feel real. With all of the unforeseen issues regarding venue changes and theater temperature, the team did a remarkable job adjusting to a smaller stage. And in a way, it worked to their advantage. It allowed the piece to become more intimate. The set by Mark A. Dahl continued the mirror image idea by reflecting the wall images perfectly. In the landscape of Fringe theater, Divine/Intervention rises above the rest. But to endure longevity, the script needs to be reworked and figured out.